I knew the day would come but didn't realise how daunting and slightly annoying it feels. My girl started preschool this week, five mornings a week. Day one was an almighty disaster with me staying the three hours with her as she threw one diva fit after another. It was seriously harrowing for us both and I ended up having to get hubby home from work early that evening as I had a major anxiety induced meltdown. I didn't feel very hopefully for the rest of the week! Tuesday he went to work late so he could drop her off with me. I briefed the teacher and we hot footed it out the door as they distracted our girl. At finish time, one happy toddler bounded out to me after having a whale of a time. She did not cry once apparently and did really well. This has been the same scenario for the rest of the week, I've come home with a happy and full of fun toddler. I've been exhausted this week, I'm now fitting in 2.5 hours work every morning. I feel like all I'm doing is driving from one location to another and clock watching. But I know it's worth it to get a toddler that doesn't cry and hate nursery (as we had before). The only downside is this...a worn out sleeping child at the most inappropriate times. 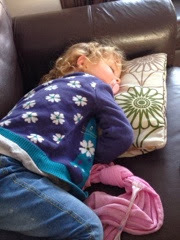 She refuses to sleep when we get home but instead sleeps at around 3pm which is dangerously late for us! The thing I wasn't ready for though is the fact I don't know what she has been upto in the day! At day nursery I used to get a breakdown of what she'd eaten and done but now I have to rely on what she tells me. It's a strange letting go feeling, it's realising she's a little person in her own right and really doesn't need me to be sticking my nose in everything. It's making my heart sing that she is enjoying this new journey but also bittersweet as this is the first stage of finding her own feet. My baby is growing up!